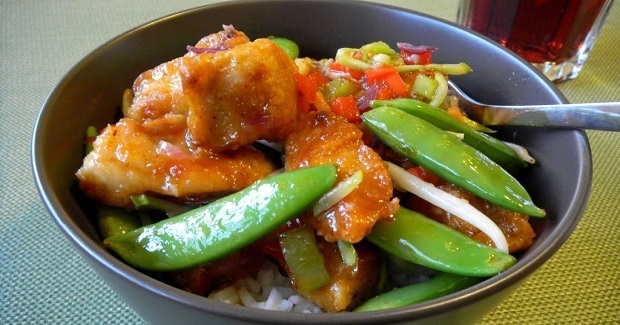 Sweet Hot Chili Stir Fry Recipe - Gutom Na! Posted on Wednesday, March 8th, 2017 at 2:47 pm. In a gallon sized ziploc bag, combine flour, corn starch, salt, and pepper. Toss the chicken into the bag and shake to coat. Heat the 1/2 cup vegetable oil in a sauce pan. Once hot, add the coated chicken chunks and cook on each side until golden brown. Remove to a paper towel lined plate. While the chicken is cooking, begin sauteing the onion and celery in the olive oil. Once the onion and celery have begun to soften, add the bell pepper and sugar snap peas. After all the veggies have softened up a bit (about 4 minutes), add the slaw, sprouts, cooked chicken, and sweet hot chili sauce. Toss until the veggies and chicken are coated in the sauce and cook just until heated. Serve over rice.